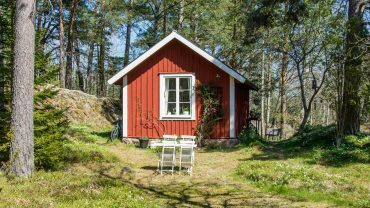 The average price of a tiny home is under $50,000. This is $150,000 less than the average home price in America! The cost is one of the many reasons more and more Americans turn to tiny homes every year. However, many families are concerned with the practical reality of tiny home ownership. We’ve found 5 of the best small bathroom hacks that will transform any space. There’s no room in your tiny house that is more important than the bathroom. Making your bathroom as luxurious and cozy as possible is easy with these great bathroom hacks! Mirrors in a traditional bathroom are not usually given a ton of thought. However, in a tiny space, your options for mirrors can make or break your bathroom. One great option for a small bathroom is a retractable mirror or a scissor arm wall mounted mirror. A retractable mirror that is attached to a wall is there when you need it, and out of sight when you need counter space. On the opposite side of the spectrum, another way to liven up a tiny bathroom is by installing an oversized mirror. While this may take much more wall space, it will visually make your bathroom feel bigger. When space is at a premium it is necessary to maximize functionality. Instead of trying to scale down a traditional bathroom into a tiny house, install a wet bathroom. A wet bathroom combines a shower, sink, and toilet into one area. The shower is not confined to a separate part of the bathroom, and it saves room while offering a huge, spa-like shower room. If having a toilet in your shower isn’t your thing consider putting your sink in with your shower instead of having a separate vanity. This will also save space but is not as dramatic as a true wet bathroom. Another way to save space in your bathroom is to consider installing a pedestal sink instead of a vanity. A pedestal sink doesn’t have the storage underneath the sink, instead, they have a flared base. Pedestal sinks give any bathroom a vintage flair and allow for more creative storage solutions outside of the vanity. When people design bathrooms many think in terms of horizontal storage solutions like dressers and low shelves. Many people don’t consider looking up for their storage. Installing hanging baskets on the wall will give your space a unique, modern feel while making use of otherwise dead space. Additionally, instead of hanging one towel rack, hang three on the back of your bathroom door. This quirky hack will let you hang three towels instead of one, which is a huge space saver. As with any other area in your tiny house, having everything organized is key. Bathrooms can be a huge area of clutter if you don’t build innovative organizational solutions into the design. One really smart way to do this with your bathroom appliances such as curling irons and blow dryers is to use PVC pipe to hang them in your vanity cabinet. You can also hang these appliances on the wall of your bathroom. 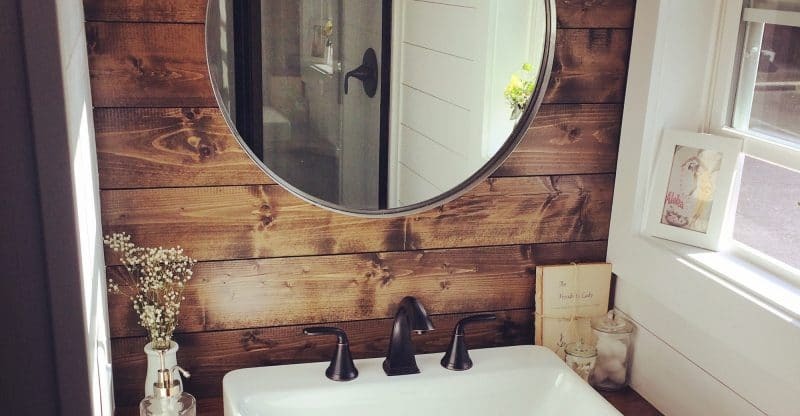 Whether you’ve been hunting for a tiny house for a long time, or just curious, our small bathroom hacks will maximize any space. For more information and inspiration check out our quick tiny house guide.